When is a tutorial not a tutorial? For me, it's when the craft project is so easy that a couple of photos are all you need in order to make it. 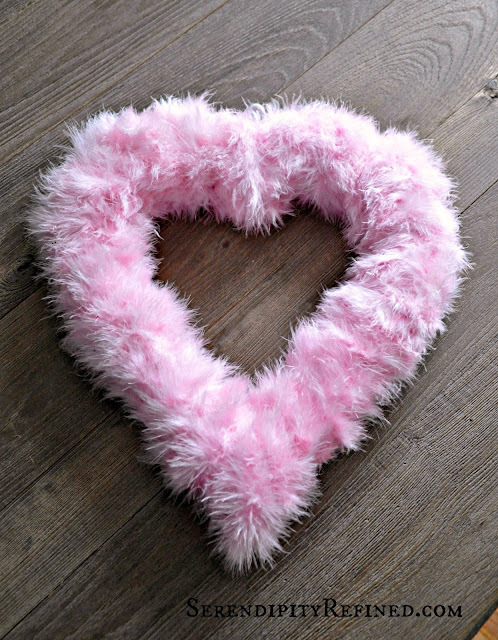 So, are you ready for a little more Valentine's Day craft that's so simple that a six year old can handle it? 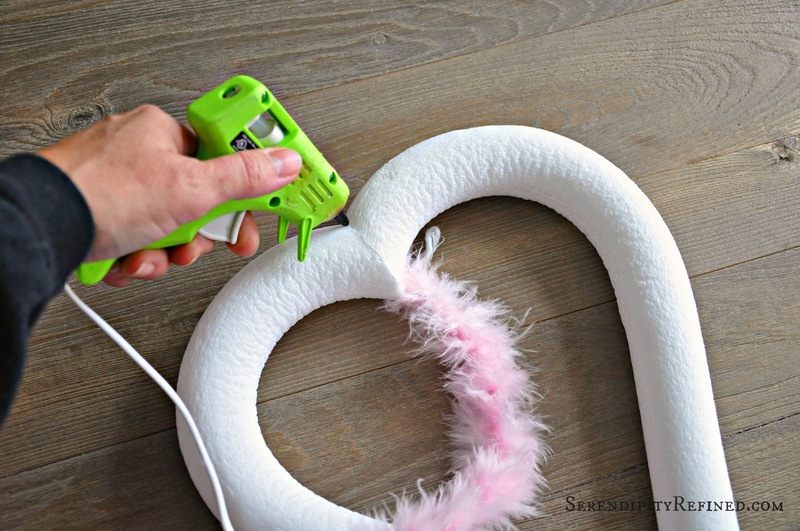 Well, you're in luck because today I'm going to show you how create an easy heart-shaped wreath in under ten minutes. 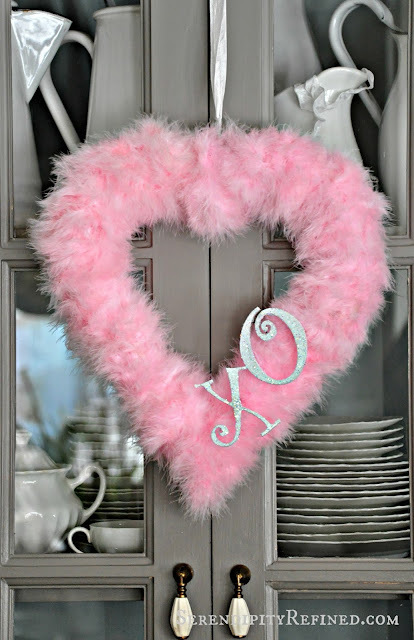 To tell you the truth, I decided that I can't even call this post a tutorial because the materials list consists of a heart shaped Styrofoam wreath form , a couple of rolls of feather trim from Hobby Lobby and some hot glue and the rest is pretty much self explanatory. In the spirit of full disclosure, this wreath is the end result of the snow storm that we had a couple of weeks ago. Of course, we've had snow a dozen times since then and if spring doesn't arrive soon, I could be in real trouble. It was New Year's Eve and the snow, combined with the fact that I left work at 4:30 instead of 5:30, meant that I found myself with an entire hour to wander aimlessly through the aisles see what new and exciting merchandise may have arrived at Hobby Lobby in during my recent, self-imposed, month-long hiatus from all craft and fabric stores during December. I managed to resist looking through the 80% off holiday decoration. The male population of my home breathed a collective sigh of relief...or at least they would have had they known. I also stayed away from the three aisles of spring planters and outdoor decor. After all, I had to scrape an inch of snow and ice off of my car to get there so, spending more time outdoors really isn't on my to do list...at least for the next couple of months. Somewhere in the framing department, I actually thought that maybe I'd get out of the store without purchasing anything at all...But then I got to the fabric department...and the racks of ribbon by the bolt. Ask anyone who knows me, I'm a sucker for ribbon. You know, on second thought, it's probably best not to bring up ribbon or Hobby Lobby at all. Let's just keep this particular trip between us, okay? Oh, right, I remember. There, in the fabric department, where they keep the ribbon, on the very bottom rack, I spotted two spools of the most beautiful pale pink feather ribbon that I've ever seen. I thought, "Hmmm...what can I do with this tiny, baby soft, pink feather boa-like ribbon that's fifty percent off?" I grabbed a Styrofoam wreath form (40% off) and an unfinished wood "x" and "o" (50% off) and was out the door with my bag in hand (and change from my ten dollar bill in my pocket) before the nice lady came over the speaker system to remind me that the store would be closing in ten minutes. The rest of this craft was so fast and easy that it took longer for me to decide whether or not to add the pink bow than it did to make the entire wreath! Directions: Hot glue one end of the feather ribbon to top of the wreath form. Wrap both rolls of ribbon around the wreath spreading out the ribbon so that the Styrofoam is just covered. 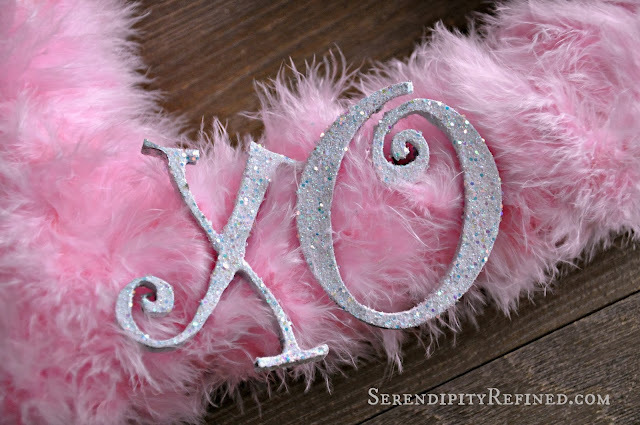 Paint the "x" and "o" white and dust them with clear glitter. Hot glue a piece of wire to the back of each letter to be used to fasten it to the wreath. Push the wired "x" and "o" into one side of the bottom of the wreath. Stand back, admire your work.. 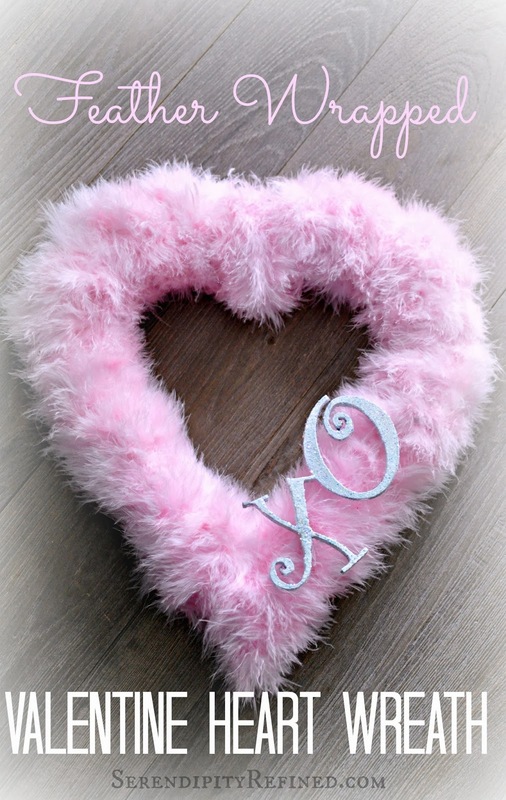 Spend an additional ten minutes deciding whether or not to add a pink and white bow and whether or not the "x" and "o" should have been silver instead of white. 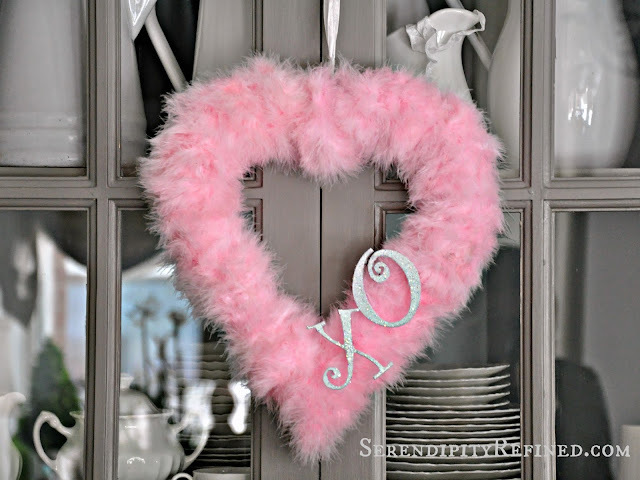 After a few moments spent searching in the kitchen drawers for skewers and a glance outside at the blowing snow and temperature near zero, decide that your pink, feather-wrapped, heart shaped Valentine's day wreath is pretty darned adorable without the pink polka dot bow or the arrow...unless there's a heat wave and the temperature gets into double digits between now and February!